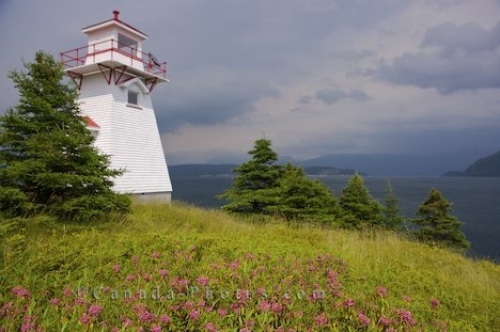 Standing near the Woody Point Lighthouse in Gros Morne National Park in Newfoundland, Canada, you can see for miles across the horizon. The scenery is made up of mountains which adorn the backdrop, a beautiful ocean view and wildflowers and greenery growing around you along the coastal shores. Rain clouds move in over the water and the town of Woody Point appears as it might get some rain or a small storm. The scenery is also magnificent on a day like this around Woody Point, as you can watch the storm slowly makes its way over the mountains and into town. Picture of the scenery near the Woody Point Lighthouse in Woody Point in Gros Morne National Park in Newfoundland, Canada.